Oregon State University Professor Philip Mote, the long-time Director of the Oregon Climate Change Research Institute ( OCCRI) and co-lead of the Pacific Northwest Climate Impacts Research Consortium (CIRC), has taken a new position at OSU. In February of this year, Phil began his new appointment as Vice Provost and Dean of Oregon State University’s Graduate School. CIRC is now being led by OSU Professor Denise Lach, the founding Director of the university’s School of Public Policy. In September 2010, Phil and Denise co-founded CIRC following the awarding of a grant from the National Ocean and Atmospheric Administration (NOAA). CIRC focuses on climate adaptation and is a proud member of NOAA’s Regional Integrated Sciences and Assessments (RISA) program, a national leader in climate science and adaptation. Phil became the Director of OCCRI in 2009 shortly after he was hired to teach and do research at OSU. A search is currently underway for a new director of OCCRI. In the meantime, CIRC researcher and OSU Professor Peter Ruggiero will act as Interim Director of OCCRI. Although Phil has taken on new responsibilities at OSU, he plans to remain involved with both CIRC and OCCRI. In particular, Phil has promised to be active as CIRC develops a proposal for a new round of funding to begin in 2020. A well-respected climate scientist with an impressive list of publications, Phil also plans to remain active in his field. He currently serves as President of the Global Environmental Change Section of the American Geophysical Union, the nation’s leading Earth and space science organization. For our readers, Phil is perhaps best known for this published research. He has been a leading expert on climate change for decades. He was an author on both the Fourth and Fifth Assessment Reports of the Intergovernmental Panel on Climate Change, and was an author on three national climate assessments, including the most recent Fourth National Climate Assessment released in November of last year. As part of its legal mandate, OCCRI periodically issues climate assessment reports to Oregon lawmakers. 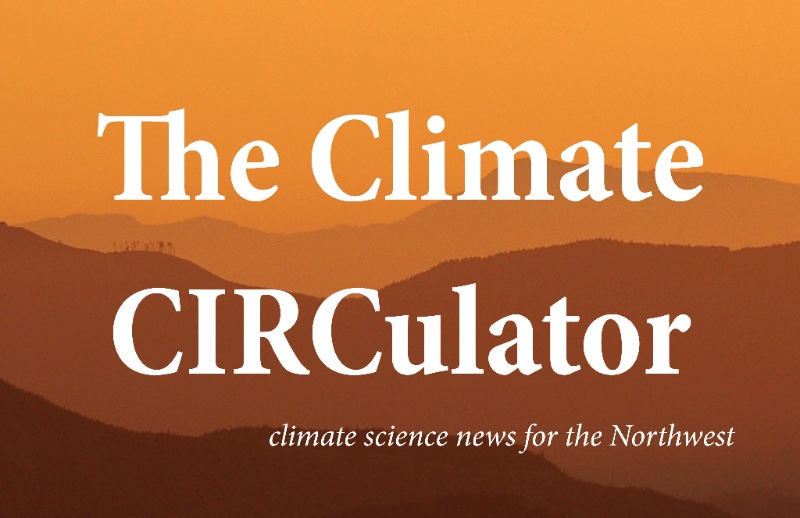 Phil has been an author on every OCCRI climate assessment report, including the most recent such report, the Fourth Oregon Climate Assessment Report, which was released this January and is reviewed in this issue of the CIRCulator. Phil’s snowpack research includes his well-cited 2005 paper in the Bulletin of the American Meteorological Society “Declining Mountain Snowpack in Western North America, an update in Nature Partner Journals: Climate and Atmospheric Science “Dramatic declines in snowpack in the western US” (reviewed here), and his examination of the record low snowpack the Pacific Northwest experienced in 2015 (reviewed here). Phil even wrote some articles for the CIRCulator. Phil, thank you for your leadership. We’ll be seeing you around. Phil will be the keynote speaker at the upcoming 2019 Spokane River Forum, Building Resilience held April 16th to 17th in Spokane Washington. Click here to register.